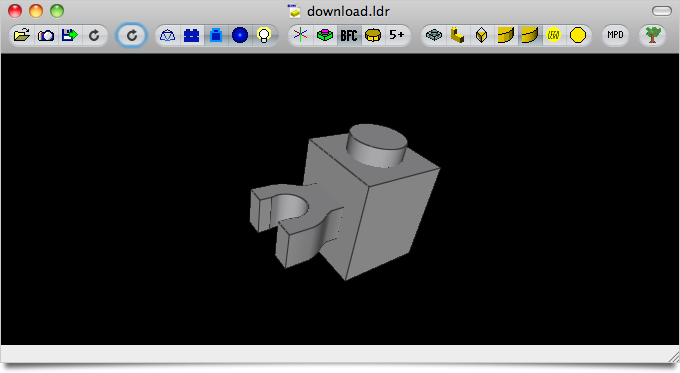 I have compiled a Mac OS X version of LSynth 3.1, the recently released update to the program that synthesizes LDraw code for flexible LEGO parts. 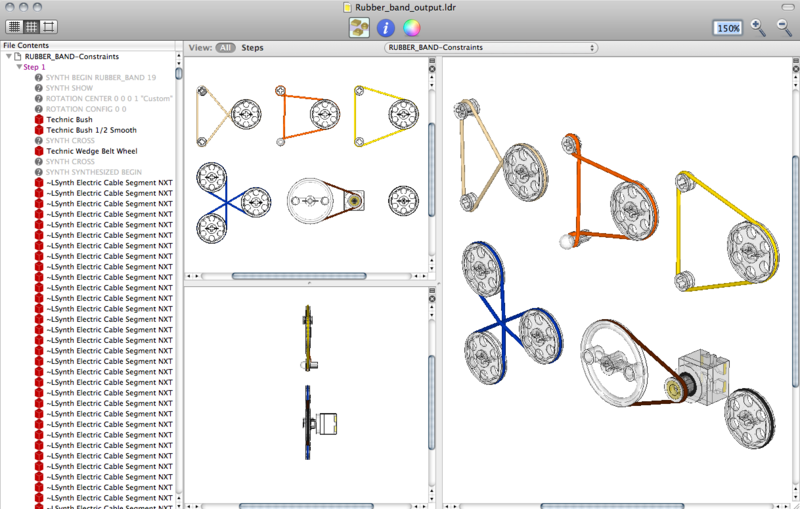 This download includes the lsynthcp executable as well as the configuration file (.zip) and the constraint parts (.zip) available at Willy Tschager’s installation tutorial page for MLCad users (which contains some useful information for all LSynth users). Important Compatibility Note: The executable in the above download may only work with Mac OS X 10.5 (Leopard) or greater. 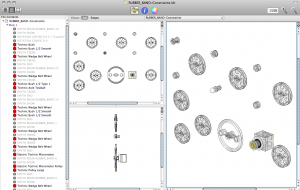 Click here to download a version of lsynthcp that should also be compatible with Mac OS X 10.4 (Tiger), provided by current LSynth developer Don Heyse. Thanks, Don! 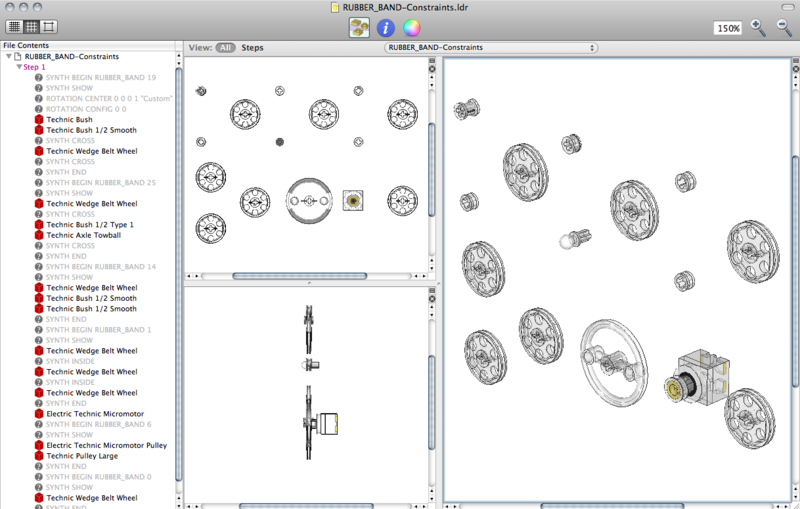 Copy the LSynth constraint parts to the parts/ or Unofficial/parts/ directory of your LDraw part library. Keep the lsynth.mpd configuration file in the same directory as the lsynthcp executable. 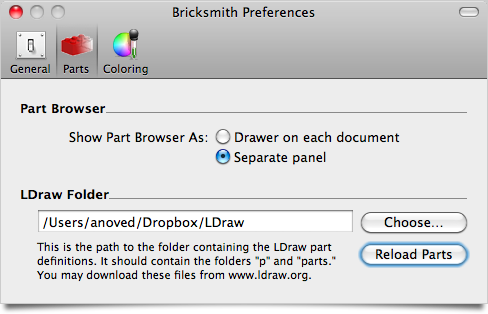 LSynth is not integrated with Bricksmith, so you can keep these files wherever you prefer. You will need to use the command line to run LSynth. 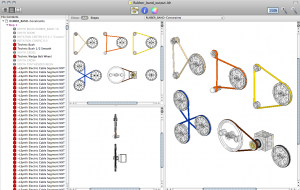 To use LSynth, you manually place constraint parts at key locations such as the endpoints of a hose. Then you input the LDraw file to lsynthcp, which generates a duplicate file containing all the hose segments, chain links, etc. necessary to represent the flexible part described by the constraints. For more detailed information about using LSynth, peruse Willy’s troubleshooting page and the pages linked above. Edit the comment on Line 69 of lsynthcp.c to begin with slashes (//) instead of backslashes (\\). Append “-arch i386 -arch ppc” to lines 3 and 17 of makefile to enable Universal Binary support. The make command is sufficient to compile the program. This release supersedes the LSynth Service I made a few years ago. Posted on Saturday, November 21st, 2009. 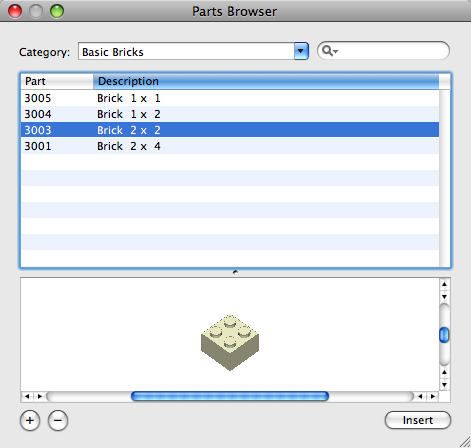 Here is a hack to add new categories to the Bricksmith part browser. 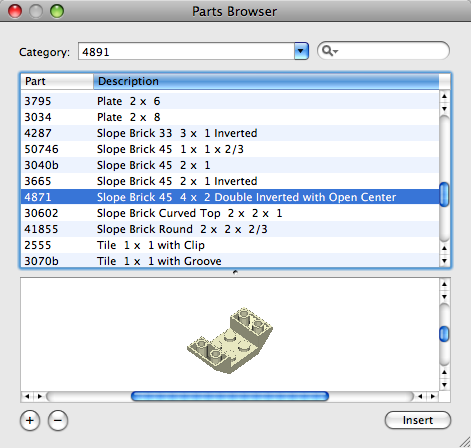 The part catalog is normally organized into categories based on the type of each part (such as brick, plate, or tile). However, if you’re building a model based on a real set, it’s just as useful to present the parts from that set in one category. Then enter a name for your category and click From File. You’ll be prompted to select the list you just created. The script is awfully slow. AppleScript’s property list commands are not well suited for making many changes. 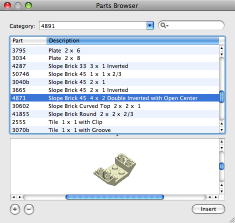 Parts listed in the file or inventory which are not already present in your part library will not be included in the category. New categories are not visible until you restart Bricksmith. (I recommend quitting Bricksmith before running the script anyway.) 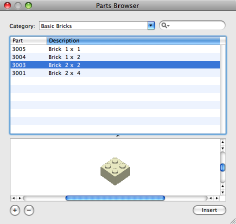 Custom categories are lost when you reload the part list from Bricksmith’s Parts preferences. No feedback is provided while the script is running. Errors are not handled particularly well. Mac OS X 10.5 is required. Posted on Saturday, June 21st, 2008.